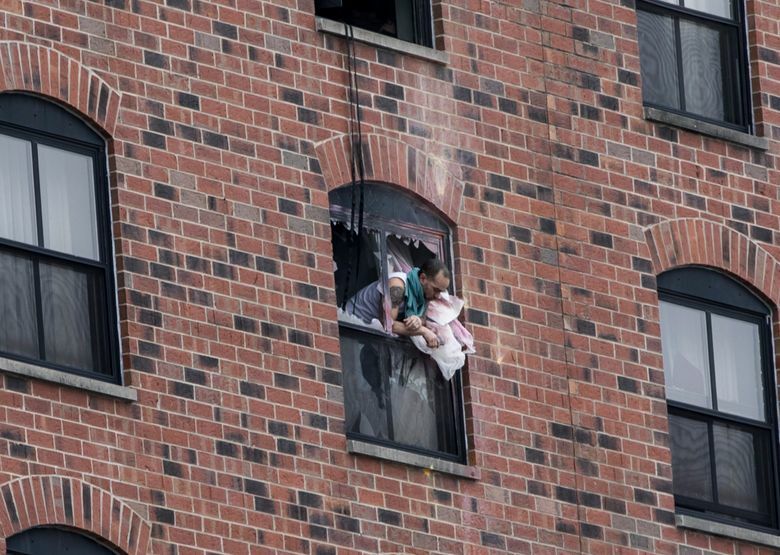 MINNEAPOLIS (AP) — A SWAT team stormed a hotel room on the University of Minnesota campus to end a 38-hour standoff Tuesday after a man who claimed to be armed started setting small fires and threatened to burn the building down, police said. The man hung out the window several times. Clark said officers backed off after they entered the room because they were concerned that he could fall and be killed or seriously injured, but they eventually persuaded him to come back inside and arrested him. He said the man did not appear to be injured, but he was taken to a hospital as a precaution. A police spokesman later identified the suspect as Rashad Bowman, 43, from the St. Paul suburb of Woodbury. The standoff began early Monday. Clark said police went to the hotel late Sunday to do a welfare check at the request of Bowman’s relatives and to try to arrest him on a felony warrant for a nonviolent “white-collar crime” out of Maricopa County, Arizona. Clark did not give details about that offense. The ensuing impasse led police to close nearby streets for a time, evacuate some hotel guests and shut down a nearby campus recreation center, but the rest of the Minneapolis campus and the hotel remained open. Classes continued as normal. A 40-year-old woman who was with the man was released late Monday. Authorities did not immediately release Bowman’s relationship with her. Clark said Bowman claimed to be armed and his local relatives told police his handgun was missing, but he didn’t have a gun on him when he was arrested and investigators didn’t immediately find one in the room. Clark declined to go into details about why Bowman refused to surrender or what officers learned about him during the course of negotiations. “There were a number of issues related to his family life, things that happened in his past related to the crime that he was wanted for,” the chief said. Mike Kjos, assistant chief of the Minneapolis Police Department, said negotiations continued “from the very beginning” until the “last seconds” before the SWAT team arrested Bowman. “When the officers rammed the door, there were a number of items including mattresses and other things inside the room stacked against the door. It was very difficult to get through the door. They actually broke the door in half, and rammed the door off its hinges,” Clark said. The incident diverted few police resources away from the extensive Super Bowl security preparations underway in the Twin Cities area because most of the tactical teams involved in the standoff had been assigned to duties not related to the big event, Kjos said. The Minneapolis Police Department is leading the investigation. Kjos said Bowman will face local charges in addition to what he was facing in Arizona.